will feature 2 shows in one night! the Toughman Contest and Fists Of Fury mma Cage Fughts. There will be tons of Toughman cobtest Fughts and both pro and amateur Mma cage fights. 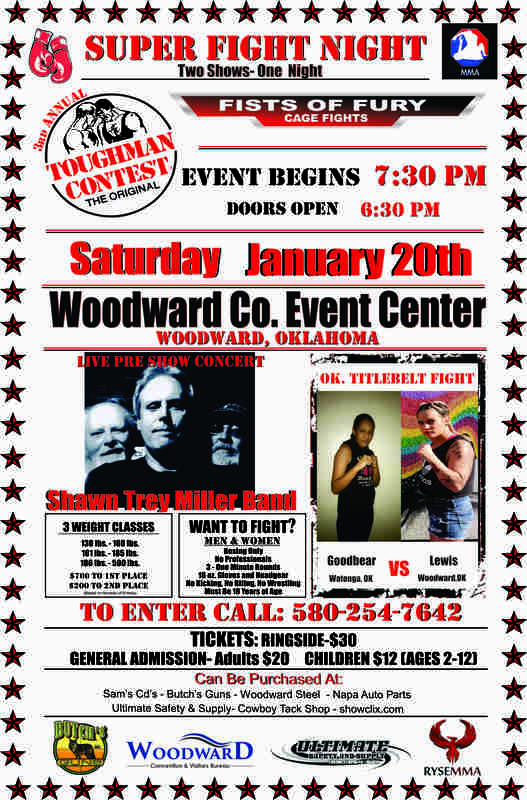 Saturday january 20 Woodward County Event Center, Woodward Oklahoma. Local men and women can slug it out for fame and fortune. An estimated $2,000 up for grabs. Musts be over 18 years old. No professional fighters, NO kicking, NO biting and. NO wrestling. Show last Apx. 3 hours. once you buy your tickets just come to the box office will call window and show you I'd. Your tickets are pulled from inventory right at the time you purchase!